It was 3:30 in the morning a month ago when I first started writing this blog post. I had to split it up because it was so long (see Adventures in Selling, Part One). My cat woke me up scratching on my door, and I couldn't fall asleep after that. For a long time, I had been wanting to express my feelings in written form, but I just felt too busy and overwhelmed to write. A phrase originated in my mind: "Writing puts me in my body." It makes me remember feelings, physical sensations, memories. For awhile, I had been feeling a bit numb. But that is changing. At different phases of my life I've contemplated changing vocations. I was never sure to what, exactly - maybe teaching art full-time, or book conservation? I would joke to myself that I wished I was an accountant. But the truth is, I have never wanted anything else as much as I've wanted to make a living with my art. As I approached my late 20's and now early 30's, I felt ashamed when I compared myself to friends with full-time careers who were able to live more comfortably and enjoy the benefits and responsibilities of other people my age. I felt like I was staying a child, while they were really growing up. I am devoted to this thing called Art. It is the thing I am the best at doing and enjoy the most. It feels natural to me. The thought of doing anything else seems boring and sad. Also, any other career I might switch to would require me to go back to school, and that would require a lot of time, energy, and money, too. But, in spite of my passion for art, I've been lingering on the sidelines. Selling art is different than making it. I've had lots of talks with friends and family about art and money. My sister Olivia Kim, who is an artist, and I were talking on the phone and she said that the upside of not making a lot of money in the beginning is that it proves to you what you've willing to work for. My best friend, Tiffany Navarro, who is an artist and educator (and presented at a Scratch programming conference at MIT in August! ), also affirmed that even if things get hard, at least we are making really cool things and having fun with it. What's more awesome than bringing something amazing into the world that never even existed before? Remember that blog post where I quit my job in March in order to have more time to work on children's illustration? Well, I exaggerated a little. I also had a second part-time job at a bookstore that I worked at 10-20 hours a week. I kept that one because I loved the people I worked with and it was fun. It also provided some stress-free financial padding. 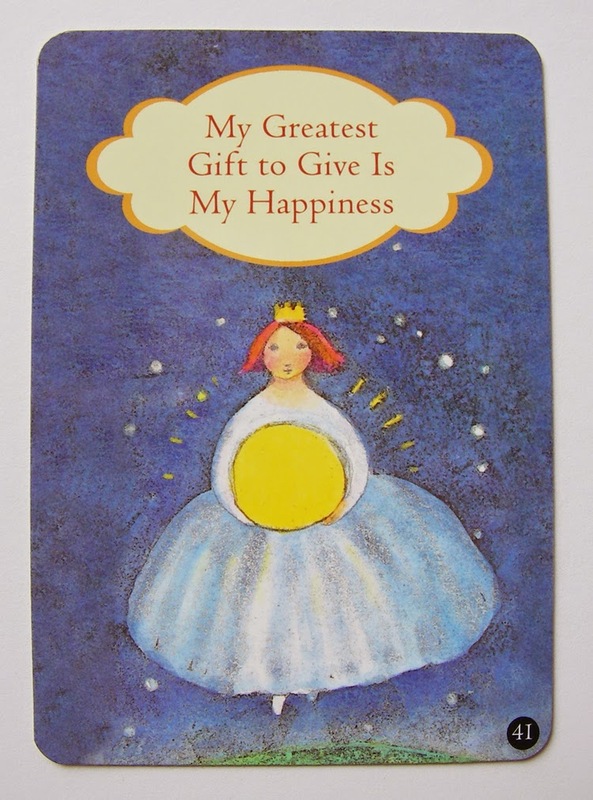 In July, I bought a card deck called "Ask and It is Given." 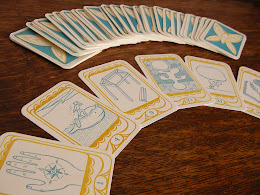 I'd first seen the deck in a shop a couple years before but for some reason I felt strongly then that I should own it. 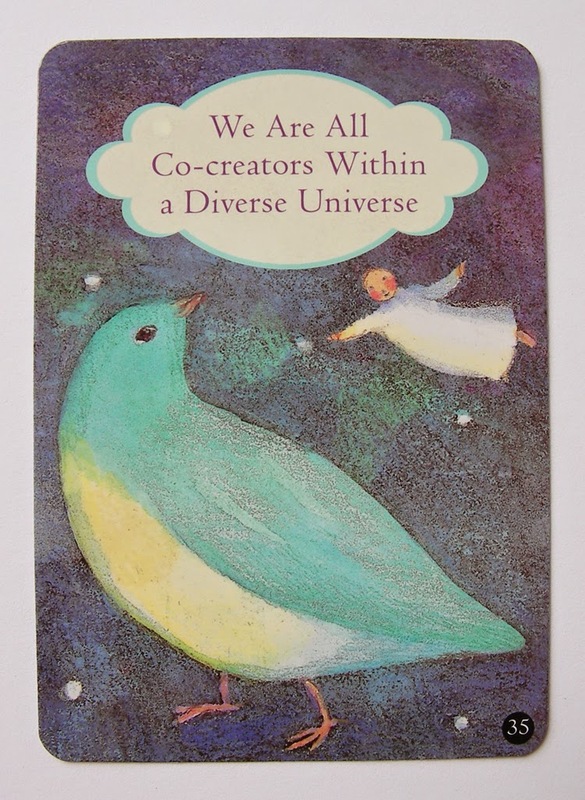 The cards have beautiful, dream-like images by Kristina Swarner with inspirational teachings culled from text by Esther and Jerry Hicks based on the teachings of Abraham. 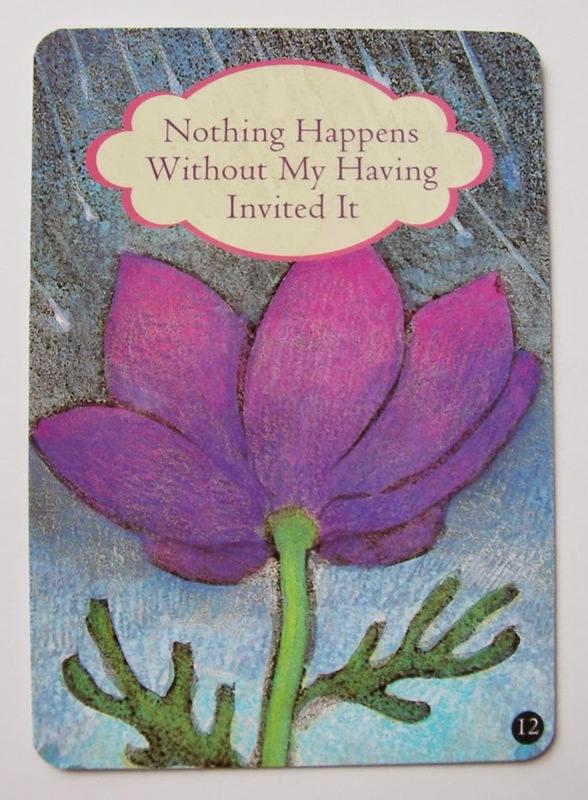 The cards speak about how your life is shaped by the energy and thoughts you radiate and invite. I looked through the cards on my lunch break at work. 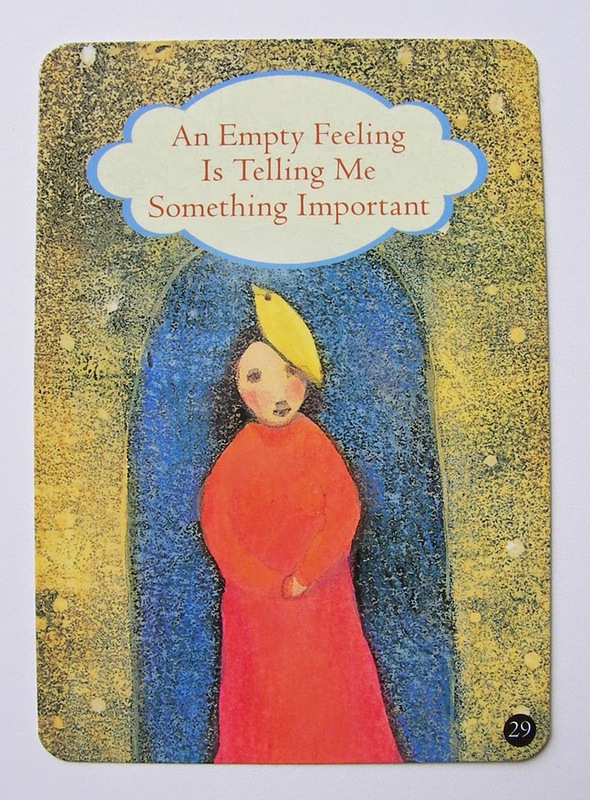 One of the cards said "An empty feeling is telling me something important" and the back of the card explained that feeling negatively is an indicator that you are disconnected with your "Source Energy." Call it God, call it the Universe, whatever you will. I thought about my feelings. A few days before I sent off that big notecard order that I talked about in my last post, I randomly woke up with a new, excited feeling. It was just there, in my body, this wonderful life and hope. Which made me realize how numb I had been feeling. Not anything horrible or even that noticeable, but my underlying anxieties and fears had taken over and crowded out anything else. When I thought about how I felt at work that day, it wasn't good. I felt blah and unmotivated. 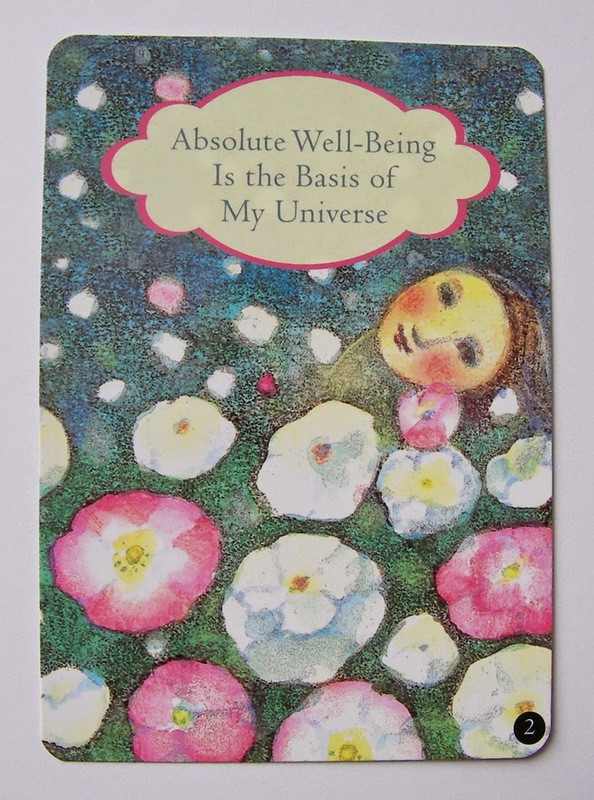 As I looked through the cards, I realized that my feelings about the job had to do with me and what I wanted from my life, not about the job itself. I'd been contemplating quitting for awhile because I was really overwhelmed trying to work on my card business and make new art. I thought that gaining back those 10-20 hours a week for myself would make a big difference, and possibly push me to be even more successful with selling my art. But for different reasons it didn't seem to be good timing. As I sat there, I thought about quitting soon and for real. A scared, exciting feeling passed through my stomach. It was then that I knew I had already made the decision. Because if I hadn't, I wouldn't have felt so scared. Still, I got home and talked to my boyfriend about it. He was surprisingly matter-of-fact about it, and said all I had to do was hustle a bit more to earn the extra money I was currently making at my job, which wasn't really that much. He said I'd been on a roll so far and didn't see why I couldn't do it. I realized that at this point in my life, I am doing better than I ever have before. For the past year I've been actively striving to build an infrastructure for manufacturing my products, explore new venues to sell my art, and implement different ways to give my work exposure. It made me more confident that not only is this my dream, but it has been a part of my reality for awhile. I gave my two weeks notice last month. It felt great! At the end of August I began to go full-time with my art business. I'll still be teaching and doing a few odd jobs here and there, but for the most part I will be spending my days working on my own business. YAHOO!!! This all happened because I made a change - inside. This change has been brewing for years, literally. Ever since graduating from college, there has not been a time when I haven't worried about money. During the past few years, I felt anxiety wondering about how I would ever afford my own home or be able to raise children. Did I have to give up having children one day because I could barely support myself? It made me very upset to think about, and I didn't have all the answers. But I'm ready now to make a comfortable living by doing what excites me. I'm learning that both art and business can be executed creatively. I think a lot of what kept me from making a full living from art in the past was not my lack of artistic skill, but my mixed feelings about money (as well as other things, which I'll get to in future posts). There's a lot of discomfort about money among, well, anyone. Everyone has different reasons for feeling weird about it. When I started selling my art, I wanted to make my art available to anyone who wanted it. But by offering low prices on all my goods, I just could not make a true living. It was a breakthrough when I realized last year that the amount of time and energy I put into handmade art would never be enough for a career if I kept going the way I was going. But I was also scared to charge more. Charging more was saying that I thought my artwork was worth more money. In a way that felt like saying that I was worth more money, and I was terrified to say that. I didn't want to seem greedy or full of myself. I didn't think I was worth deserving more than I had. I had gotten material value mixed up with true worth, which is priceless. Last year, my aunt came up with the idea of printing my art on cards and she was invaluable in helping me to start my notecard business. Because I don't have to spend time doing everything handmade, it allows me to offer my art inexpensively and sell my cards in lots of stores. This has been a big shift because I've decided I don't have to worry about tailoring my original art to be sold cheaply by reducing my labor and materials cost. Instead, I will spend the time I need, charge more for the original art I make, and look for the right audience that can afford it. It took a lot of effort for me to take a stand and decide to value my own time, energy, and artistic talent. Maybe not everyone can afford the originals, but I can't afford to make art if I don't charge more. I was literally running myself out of business! Ah, do you see the paradox? A few weeks ago I got upset at my boyfriend because I asked if he'd like to take a break from work to go for a walk and he said he was too busy. "Even just 20 minutes?" Too busy. It struck a nerve and made me very angry. Because often he gives me the excuse that he is too busy to enjoy simple and brief pleasures. I realized that "too busy" is an easy excuse to give to anything that you don't want to do. Everyone's busy. People deliberately choose what they spend their time and energy on. I've often given the excuse that I'm too busy, and sometimes it's true, but sometimes it's just because I don't want to. My boyfriend and I talked about it and came to some peace, but it stuck in my mind. A few days later, I came to a weird realization that MONEY has always been my excuse. "I can't afford it." "I can't do ______ because I don't have enough money." A lot of times in my life this has been true. Yet, if I really wanted to do something, I found a way to get the money for it. I never again want to make money my excuse for doing or not doing something. I want to be accountable for the choices I make, not act like a victim who is always broke. There are many countries in the world where true poverty exists, and it is entrenched and debilitating. For those people, the possibility of change is very, very difficult. I've been very fortunate not to experience this kind, but I have experienced how poverty can be a state of mind. In fact, the only way to change true poverty is by first changing your mind, by allowing for the possibility of abundance as a reality. You can see examples of this in people who win the lottery and then squander all their money quickly because they didn't adjust their minds and actions to fit a reality in which abundance was ever-present, not just a chance gift. It's not an easy thing to do. I feel like I have now unlatched the gates to material prosperity. Maybe it was just one of those U-shaped latches on a chain link fence that you can flip up effortlessly, but I did it. And now there's nothing separating me from the life I want to live. I don't expect huge changes to happen right away because I know that my business will take time to build. But I can already feel and see it happening. While I know I may be scared sometimes about when or how much money will come rolling in, I feel much more flexible and less frightened about it than I ever have in my life. I finally trust that I will have enough. I don't have to haggle about every penny I spend. More will come in when I need it to. Money is just a physical object/concept that you can exchange for goods or experiences. I want to travel more, I want to go to artist residencies and take more classes, I want to not always order the cheapest item on a restaurant menu. I want to send my parents on a wonderful vacation. I want to set up a scholarship fund for kids who want to go to art college. There is so much I want to do with the money I'll make. My new attitude toward money is that having enough will allow me to experience the joyful things I desire and enrich me personally. It will allow me more options for doing and creating, as well as getting more art into the world. To me, that's worth it.